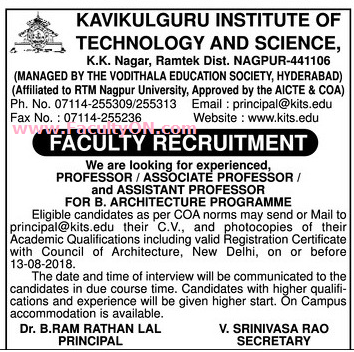 Kavikulguru Institute of Technology and Science, Nagpur has advertised in the LOKMAT newspaper for the recruitment of Professor / Assistant Professor / Associate Professor jobs vacancies. Interested and eligible job aspirants are requested to apply on or before 13th August 2018. Check out further more details below. About College: Kavikulguru Institute of Technology and Science is an engineering college affiliated to the Rashtrasant Tukadoji Maharaj Nagpur University and situated in the city of Ramtek, Nagpur district in the Indian state of Maharashtra. How to Apply: Interested and eligible candidates are requested to send updated CV along with photocopies of academic qualifications including valid Registration certificate with council of Architecture and recent PP size photos to the following email address or postal address.